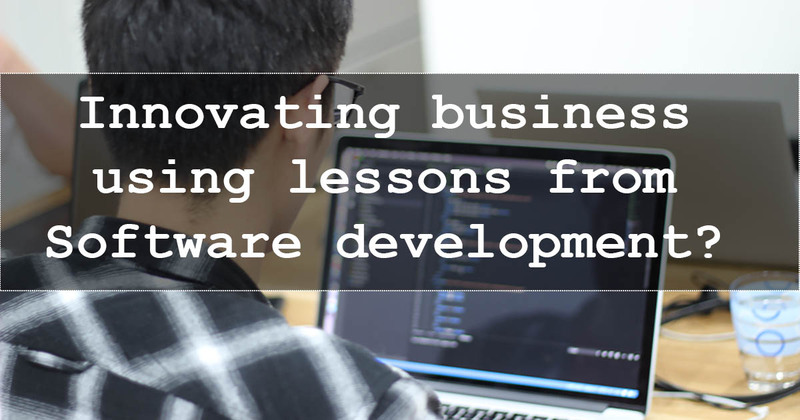 Innovating your business using lessons from Software development? Home IT Outsourcing Innovating your business using lessons from Software development? Every day, you may hear a lot about the guideline how to work well with a dedicated software team, how to find the best outsourcing software development in Vietnam, the US, Japan or other countries. These means most of the web and mobile development companies are applying a similar process concept, which results in customers’ requirements and demands. Do you think this process can be broaden applied? Do you believe the process can work well? What may you learn from the software development process to apply to your business? This article will explain and summarize the key lessons you can learn from software development company’s process as well as explain the reasons to apply the process to your business. An app owner has an idea of outsourcing and developing a mobile app, he may think that his idea meets customers’ requirements and may satisfy a large number of audience. However, this is only his assumption, and in reality, there will be a lot of issues during developing and advertising an app. By using the idea of only app owner, we cannot say the app will be successful or not. That is a reason why market research is born, which is used to determine the potential of an app and which features should be included in the app. Not only in software development, but every business also requires the survey, testing, or market research to make sure the business is developed on the right track and meets end-users’ demand. It may be considered as the first step of any business strategies. By using market research, people can get an overview of the market as well as learn how to develop a product in the market. If the challenging assumptions are not in your business plan, your business strategy may meet the troubles in developing which wastes your time, money, energy while developing the wrong product. Besides testing your assumptions, listening skill is another way to get customers ‘demand, which guides business owner the way of success. In the software development section, we use UX research to find out end users’ problems and solutions for these issues. This is another way to test the assumption after collecting users’ preferences, needs, wants, and goals. Playing as a user role, a business owner should put customers in the centre of the business, through the whole development process and ask himself/ herself “If I were a user, what would make sense to me?”. This technique is also applied by some famous brand names as Airbnb, Apple, Google… where they always put their customers in the centre of every issue before making decisions. And their success stories show the effectiveness of constantly keeping customers in mind in doing business. Testing your assumptions and listening to customers may bring you the basic idea of customers’ requirements, but you cannot put all the features to satisfy all users, this may make customers confused because of too many functions in an app. This situation is similar to the case of other business. In term of software development, we use two best practice to avoid the above case study, including Agile practices and MVP (minimum viable product). Agile provides the cyclical path of developing an app, building, testing, launching, receiving feedbacks, learning, and fixing, and testing again. This completed cycle helps developers find out the bugs as well as the feedback from customers to improve the app quality. MVPs solution means building a mobile or website application with only the key features which are truly essential to it. By launching the small app package, end users can quickly send feedback to the developers to check if the app requires any added functions. With the small budget to invest in a new application, MVPs should be the best solution for business owners. Optimizing the number of features will save the cost and time to build up an app and get the feedback from users. These two methods are not only useful for IT companies, but also other business. For example, some manufacturing companies as Honda, Nissan, … often applied a similar method as Agile to improve products quality. For example, they provide a new car, launch this new car to the market, ask for the feedback from customers and improve the design as well as the quality of this car, then provide the new version of it. For the start-up business, it is necessary to apply the MVPs solution to the first start and concentrate on the small business. That time, business owners have time to learn the real requirements of customers and guarantee the product/ service quality. Do you think multitasking improves working efficiency? Research shows that dividing attention among several tasks may reduce productivity as well as increase the stress. People may take time to transition from the first task to the second one, which leads to increase the starting time and errors. Therefore, some developers use Kaban method- which focuses on one task, finish it before moving to the next task. Kaban practice can also be applied to another business to improve the working productivities and make sure the errors because of not focusing on the current tasks may be limited. In software development, before starting a project, a project manager has to build a backlog to list down all objectives and steps to finish a product. As you know, there is many things to do during developing a new project, if you do not break down the project into a small stage and put it in the checklist, you may forget it while many stages occur at the same time. Same to other business, if a business owner does not list all the required activities and objectives before starting a business, they may be messed up because there are a lot of things to do. There are five lessons from software companies which can be expanded and applied in other business. Adamo Digital hopes after reading this article, you can easily apply to develop and maintain your business. Working With a Dedicated Software Development Team? Want to plan mobile app development in 2019? What are F&B technology trends in 2019?